In the current trend hospital and doctors are becoming a part of lifestyle for a human beings since they meet each other 12 to 30 times in the life span to analyse the disease report. However population is quite increasing in terrific way based on the survey from 7.5 billion population suffers in one third people that they search doctors’ appointments periodically. From this strategy you might understand the demand for the hospital searches through our scriptit helps to ladder your business in a fruitful way. 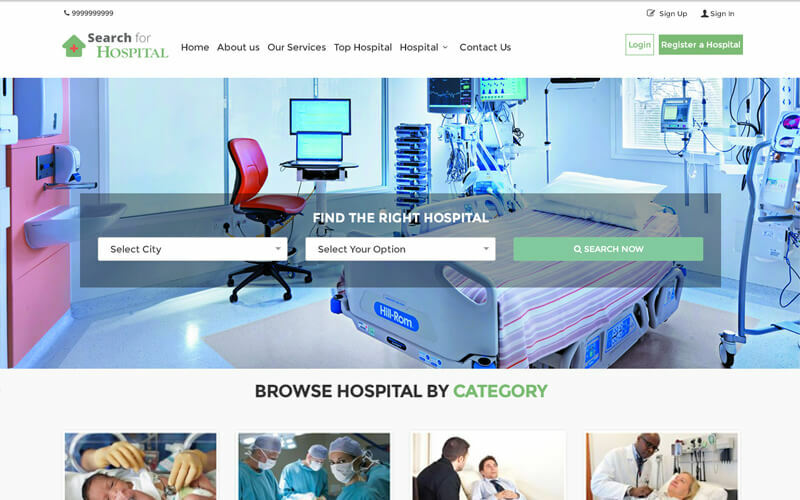 Our Hospital Search Script is the one of the prime listing websites for doctors and hospitals as well, we have developed this script to ensure giving a pleasant business for hospital owners and doctors. We are giving a very simplest coding design for the start-up company that they register a profile to hospital industry. Our Classified Listing for Hospital to be SEO-friendly by optimizing with accordance Google standards making your website search engine friendly, thereby increasing your website ranking and produce more organic search results from the major search engines including Google and Yahoo without any hard work on search engines. I would like to inform that our Readymade Php Multi hospital Appointment Listing Script, includes exclusive features like social sharing and social login which makes users to register accounts in a reliable way and spreads business via social networking becomes easier. Through search option users are allowed to search the nearest city and preferred doctors with filter options, according to the needs and necessity the end user filter the hospital and doctor in an optimal technique. Our Hospital Search Script has many revenue models includes banner advertisements, Google AdSense and membership model etc.our script is developed with PHP MySQL platform that it makes customization becomes flexible based on the requirements, our business module to give up a user friendly structure and any hospital and doctors can register themselves, they can post their details to the dashboard. Apart from that end users can review the hospitals based on the services they provided. If you face any other queries, you can reach out to us and we will be happy to help you. I would recommend this script for the listing the required doctor and hospital listings. I bought this hospital script from them really such an active 24×7 response from the support team in a time of need, however the support based on priority which makes some delay. Simple and good code design with fabulous user interface with exclusive factors. This Hospital Search script helps to locate the hospitals and doctor’s appointments easily. Well, developed script… that’s look awesome and pleased with it.